A- 3 v 3. Shoot before you cross the 18 yard line. 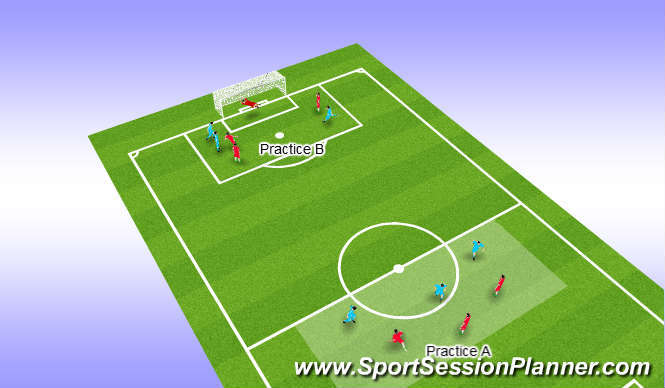 B- 2v2 link to score with your team member in the opposite half of the penalty area. One touch finish. 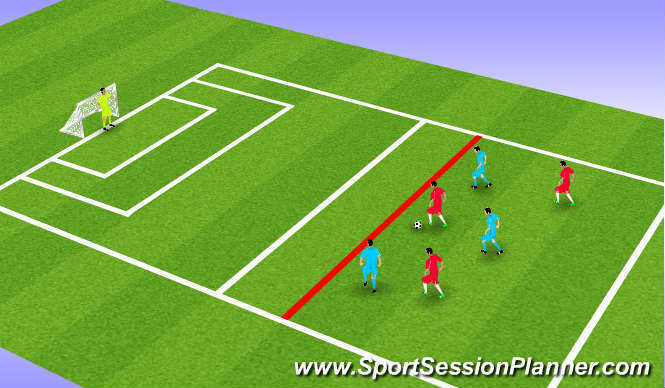 3 v 3 30 yards from goal break through red line to run in on GK to score defenders may chase. Awareness of angle a distance re support. one- two&apos;s. over laps. dribbling one toch play. Creation and use of space by individual & three. shooting no more than two touches and 75% of goals- 1 touch. Anaerobic work in tight areas, adjustment of body to recieve and shoot. Can we deliver the right technique under pressure to shoot at the right time. The session was delivered in appaullingconditions, torrential rain, gale force winds. the playersadapted well but again found difficulty in visually being aware of space between defeners and the delivery of one-two&apos;s, overlaps,one time play etc.